RRResearch: Blue screen logouts in Excel - Numbers is not the answer. Blue screen logouts in Excel - Numbers is not the answer. Ever since I upgraded to Snow Leopard (a couple of weeks ago), my Mac has been suffering from 'blue screen logouts', especially in Excel. The screen briefly goes blue then I'm back to the desktop with all my open applications closed (and having lost any unsaved work). The solution may be to finally switch from Office 2004 to Office 2008. I think we did buy the Office 2008 suite a couple of years ago, but maybe we only bought a one-computer version that was installed on the laptop of a post-doc who's long gone. Weird? Let me count the ways. This is a 3-D graph. The lines are 3-d, like ropes. The lines have 3-D shadows. There are no visible axes. 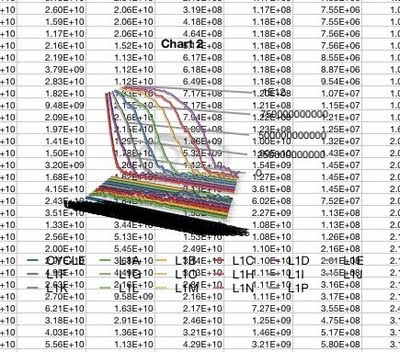 There are some numbers connected to some of the lines. The legend at the bottom seems to treat the X-axis values as Y-axis values. Maybe I should have started with something simpler (this was about 15 columns of data). Now it's crawling when I just type 1, 2, 3 etc., but it speeded up when I closed the large file. Ah, the problems with the previous graph were partly that I had accidentally chosen 3-D. But my new graph is terrible too. The symbols are enormous and I can't find any way to change them or remove them. My X-axis values are being treated as Y-axis values - I don't know what it's using for the X-axis as the numbers are illegibly jammed together. My column headings (Cycles, Scores) are ignored. Aha, changing to a scatter plot got it to use my Cycles data for the X-axis values. But now the lines connecting the points have disappeared and I see no way to get them back. 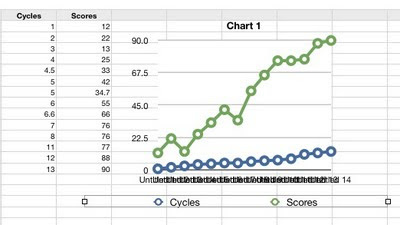 And the new legend says that the Xs represent cycles, when they're really Scores. Instead moving the Cycles data over into the grey first column gave a semi-presentable line graph, but now it's not treating the Cycles values as numbers but as textual labels, even though I discovered how to tell it that they are numbers. I'm afraid Numbers appears to be just a toy app, suitable for children's school projects but not for serious work. I would RTFM but I can't find anything sensible. Numbers is a fairly powerful program, but it's not Excel, and you can't use your Excel experience as a guide in Numbers. To edit your graph you need to go to the Inspector (the floating box; hit Cmd-I if it's not shown). Click the Chart icon (a stylized bar graph). You can now edit all the axis parameters, the number of column headings, the size of the symbols, etc. You can change orientation of the text, etc. Switch X and Y axes with the little icon that is adjacent to your data. It's hard to show over the 'net, but all your problems would take about 15 seconds to change. That said, there are a few things Excel does better than Numbers. Conditional formatting is much more flexible in Excel, for example. But for about 90% of my charts and tables I use Numbers. I haven't had any problem using Excel on Snow leopard, but I don't think I've used the Office '04 version, just the Office '08. Have you checked out Open Office? I keep thinking that I will but haven't gotten to it yet. And I am *slowly* getting more proficient at the graphing functions in R. I really need some "R for the programming-challenged" sort of crash course. I was going to try again now, on my home computer, but it appears to only have the 06 version of iWork, with Keynote and Pages but no Numbers). As the former Redfield lab postdoc with Office 08, I can recommend the upgrade. The first few months were frustrating because several key functions had been removed from Excel, like the ability to define error bar values, but updates have restored these functions and improved stability. Nevertheless, I've made the transition to Pages for word processing, and use Prism for all graphing because it is a graphing/analysis program for scientists (unlike Excel and Numbers). I've heard that Prism has problems in Snow Leopard, but fixes are in the works. ROsie - I don't know of a good tutorial (I haven't looked). I learned through trial and error. It's easier when you start with simple stuff and gradually move on to real data, which by chance was what I did. I've never tried to do one of these before, so hopefully it will work for you. I tried to go a little slow and make things explanatory, which seems to have resulted mainly in randomly waving the pointer around, but whatever. Aiayork: Aah, I'm starting to catch on. Thanks for the movies! What I had was iWorks 08, so I've downloaded a trial version of iWorks 09. @BB: I've been hoping not to have to learn R before I die. But the post-doc is learning it - I'll ask him whether I should too.